Petzel Gallery is pleased to announce a special collaboration between Allan McCollum and Andrea Zittel. This exhibition marks their second collaboration and the first to be exhibited at Petzel Gallery. 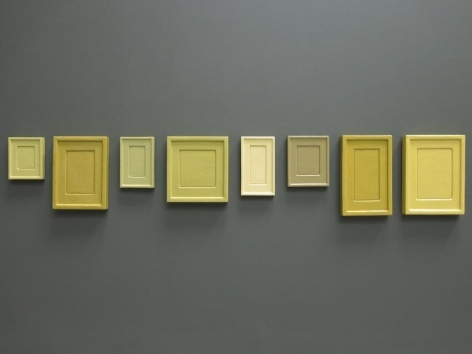 The basis of the collaboration is Allan McCollum’s Plaster Surrogates, a series he began in 1982, which is a variation of his Surrogate Paintings that began in 1977-78. To produce Plaster Surrogates, McCollum and his assistants engaged in repetitive communal labor carried out in several stages: the creation of molds, the casting of plaster, and the application of enamel paint to create a smooth surface that renders the Surrogates as a sign for paintings or other framed works on a wall. Much like stage props, they encapsulate the act of looking at art. For this collaboration, each Surrogate is painted monochromatically, using colors chosen by Andrea Zittel. 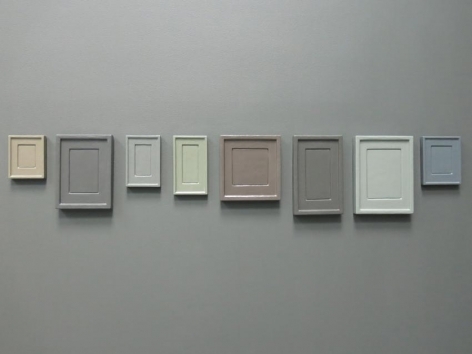 McCollum and Zittel then collated twenty-four Collections of Eight Plaster Surrogates, each unique, using ninety-six colors. 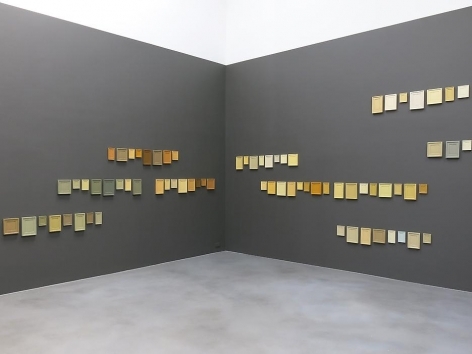 Plaster Surrogates Colored and Organized by Andrea Zittel marks a new foray into a communal artist practice where two artists and friends challenge the conceptions of mass production using hand-made objects and distinct aesthetic and organizational choices. Zittel works and lives in Joshua Tree, California, an environment that undoubtedly influenced her color selections. Similarly, as the founder of smockshop, a now defunct communally run non-profit artist project that aimed to unify individual artists into a collective oeuvre, Zittel’s practice echoes McCollum’s history of making objects with communities of artists who create extensive bodies of work by hand. McCollum constructs an emblem with his Surrogates, and examines what it means to be a working contemporary artist by way of the Surrogates’ symbolism, considering the role of seriality in contemporary art-making. 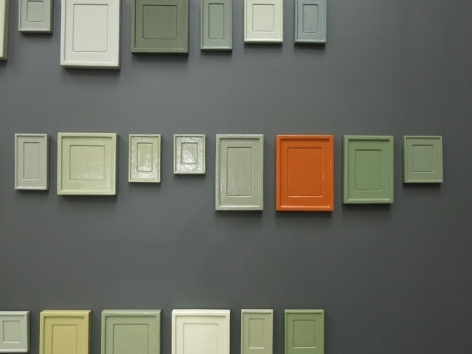 Zittel makes each collection unique through selection and organization by defining the Surrogates’ hues and then by designing the installation. These sculptures, and this collaboration, reveal the social game of producing and displaying art objects through practices that are both systematic and distinct, a notion evident in the careers of both artists. Since McCollum’s decision to be an artist in 1967, he has viewed his work as an attempt to understand the world from the view of an anthropologist, or as he often describes it, as an “anthropologist from Mars.” This is apparent in the many questions he asks in his work: What are “collecting” objects all about? What qualifies an object as a “collectible?” What are these rectangular cubicles we live in? 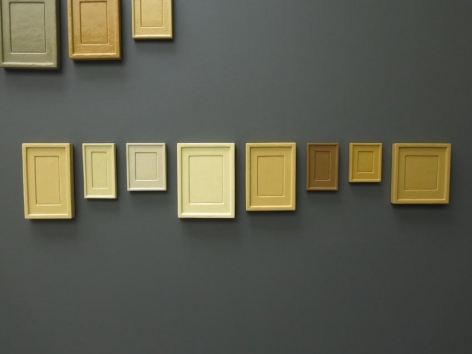 What are these rectangular objects we hang on our walls? What are these rules we use to separate social classes? And how does what we call “art” facilitate this organization of people into those considered “more important” and those “less important?” What is the difference between fine art and home-craft? What cultural rules govern the valuation of things? For instance, I find myself analyzing the subtle distinctions or social roles that separate fine art from design – while trying to understand what psychological need this separation serves. Or on a more fundamental level, I wonder how we attribute roles such as ‘table’ or ‘bench’ to a horizontal surface on which things can be placed, or ‘art’ to a flat element that is hung on the wall in order to be looked at. My intention is not to collapse these categories and value systems but rather to reveal their overlooked significance and to understand our inherent psychological need to give objects personal and social relevance. McCollum & Zittel have been friends for many years. 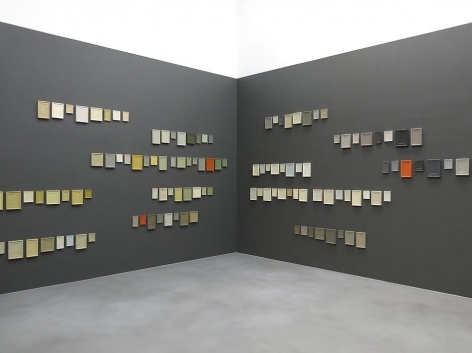 Since McCollum’s Surrogate Paintings and Plaster Surrogates are very much “panels for thought,” McCollum asked Zittel if she was interested in choosing colors for these “panels” and then organize them at Petzel Gallery according to rules she invents, rather than following his own. Allan McCollum was born in 1944 Los Angeles, California, and lives and works in New York City. His work is in over seventy museum collections, including the National Gallery, Washington, D.C.; the Museum of Modern Art, New York; the Guggenheim Museum of Art, New York; The Metropolitan Museum of Art, New York; the Whitney Museum of American Art, New York and the Los Angeles Museum of Contemporary Art, Los Angeles. Solo retrospectives of McCollum’s work have been held internationally including at the Musée d‘Art Moderne, Villeneuve d’Ascq, Lille; the Sprengel Museum, Hannover; the Serpentine Gallery, London; among many others. He has produced public art projects in both the United States and Europe. He recently completed a special commission for the Elmhurst Community Library in Queens, New York. This fall, his work will be included in the 9th Bienal do Mercosul, in Porto Alegre, Brazil, curated by Sofía Hernández Chong Cuy. Numerous texts on McCollum’s work have been published by a number of art historians and critics including Rosalind Krauss, Craig Owens, Hal Foster, Anne Rorimer, Lynne Cooke, Lars Nittve, Thomas Lawson, Catherine Quéloz, Helen Molesworth, Johannes Meinhardt, Claude Gintz, Suzi Gablik, Nicolas Bourriaud, Rhea Anastas, Nancy Princenthal, Martha Buskirk, MaryJo Marks and Jill Gasparina. In 2012, JRP Ringier published a monograph of McCollum’s work. Andrea Zittel was born in 1965 in Escondido, California. She received a BFA in painting and sculpture from San Diego State University, and an MFA in sculpture from the Rhode Island School of Design. In the early 1990s she established her practice in New York. One of her most visible projects in New York was A-Z East, a small row house in Brooklyn, which she turned into a showroom testing grounds for her prototypes for living. In 1999 she moved back to the West Coast, and currently lives and works the High Desert region next to Joshua Tree National Park where she developed A-Z West and co-founded High Desert Test Sites. 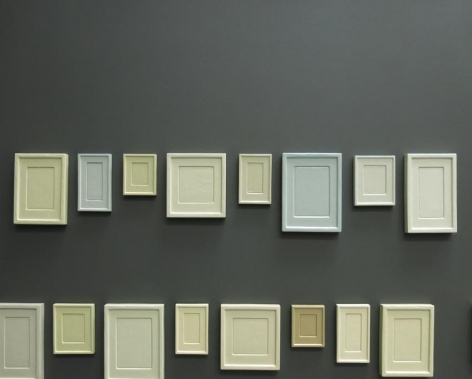 Zittel’s work has been the subject of several one-person exhibitions throughout Europe and the United States. Her work is in the collections of institutions such as the Museum of Modern Art, New York; The Metropolitan Museum of Art, New York; the Hammer Museum, Los Angeles; Moderna Museet, Stockhom; Museum of Contemporary Art, Chicago; among many others. Zittel had a significant museum survey at Magasin 3, Stockholm in 2012. Monographs on her work include Andrea Zittel: Between Art and Life, Andrea Zittel: Critical Space, and Andrea Zittel: Gouaches and Illustrations. Andrea Zittel is represented by Andrea Rosen Gallery in New York, Regen Projects in Los Angeles, Sadie Coles HQ in London, Massimo DeCarlo in Milan and Spruth-Magers in Munich. This is Allan McCollum’s sixth exhibition with Petzel Gallery. 1 Gray Watson, “ALLAN McCOLLUM,” interview, Artscribe, December/January, 1985/86. 2,3 Zittel, Andrea, “Artist Statement,” published by Andrea Rosen Gallery, 2012.